Exploring the Upper St. Regis Lake, Spitfire Lake, and Lower St. Regis Lake Lakes provides views of historic Great Camps. These lakes are connected by wide channels. These are a large lakes vulnerable to weather, which can create choppy water. Three accessible boat launches and one carry that is only .6 miles long adds up to a classic loop. Upper St Regis Lake Boat Launch Latitude: 44.3949091528 Longitude: -74.2698393948. 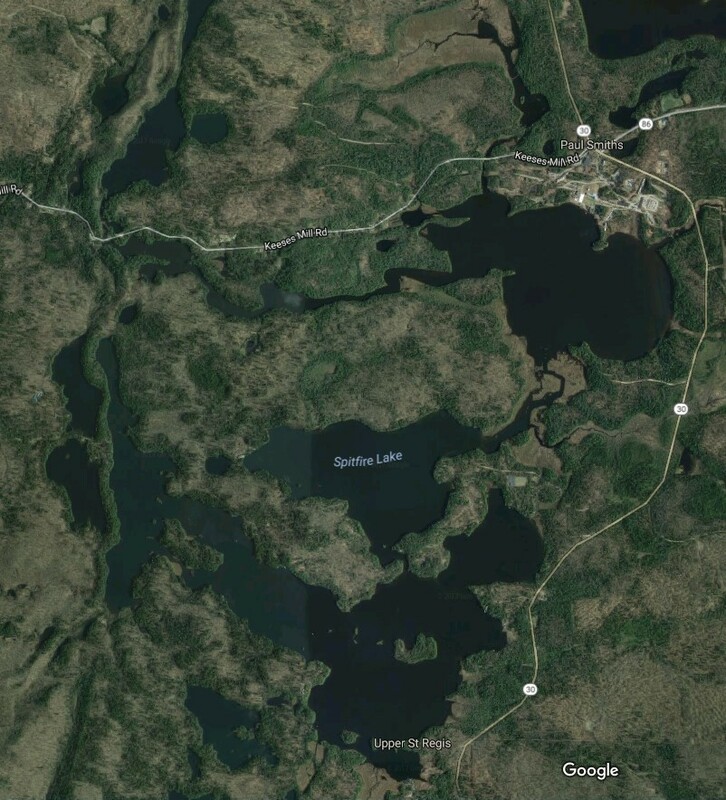 Access to Upper St. Regis Lake is from a small town launch at Upper St. Regis Landing, just off Route 30, between Paul Smiths and Lake Clear, off St. Regis Carry Road. Upper St. Regis Lake along with Lower St. Regis Lake and Spitfire Lake, became famous in the late 19th century as a summer playground of America’s power elite, drawn to the area by its scenic beauty and by the rustic charms of Paul Smith’s Hotel. It is the site of many grand old summer “cottages” and Great Camps. Upper Saint Regis Lake is part of the original Seven Carries canoe route from Paul Smith’s Hotel to Saranac Inn. Upper St Regis Lake consists of connected water bodies full of historic great camps and boathouses that make for a great tour. The lake is 742 acres in size. Average depth is 25 feet with a maximum depth of 90 feet. Skip and I drove up in the morning and launched from the Upper Regis Landing about 11am. We proceeded north along the western shore and stopped at a small waterfall coming out of Spectacle Ponds. 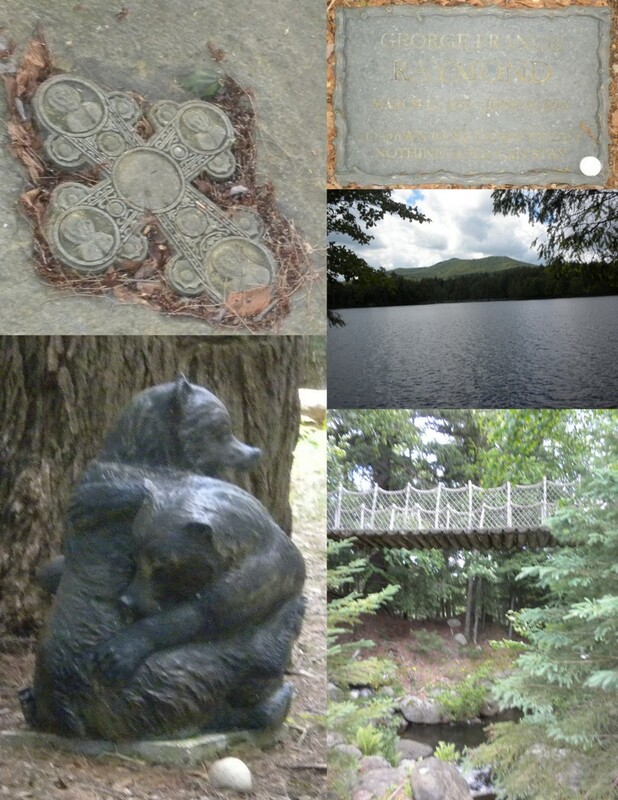 Walking along the stream we saw stone carvings and a tribute to George Francis Raymond. A search discovered his obituary but no described connection to the Adirondacks. We continued north and began what we thought was a short portage leading to Black Pond. 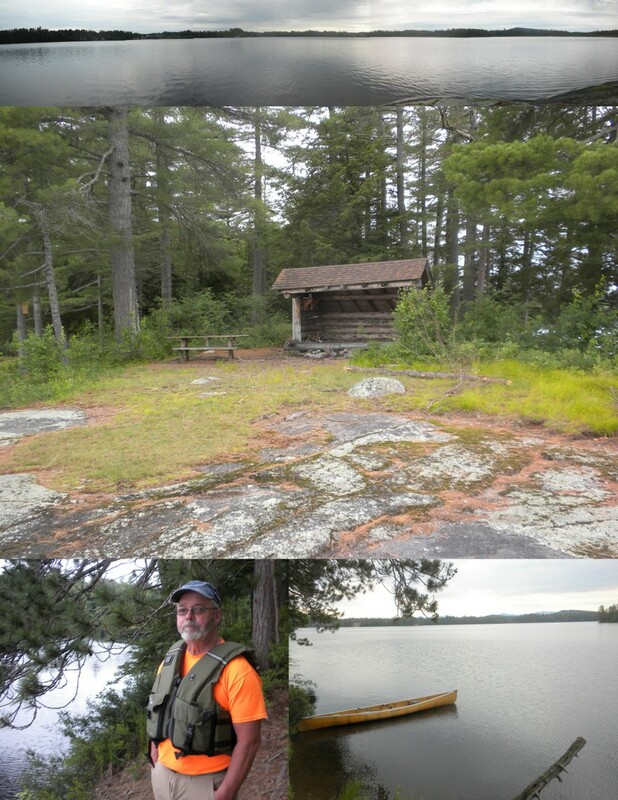 However, after a portage and hike of a mile we decided to return and approach Black Pond from Lower St Regis Lake. We continued our clockwise tour of Upper St Regis Lake, sticking close to the shoreline as the wind was causing breaking white caps on the lake. Somehow we missed the access to Spitfire Lake and made a complete loop back to the boat launch. 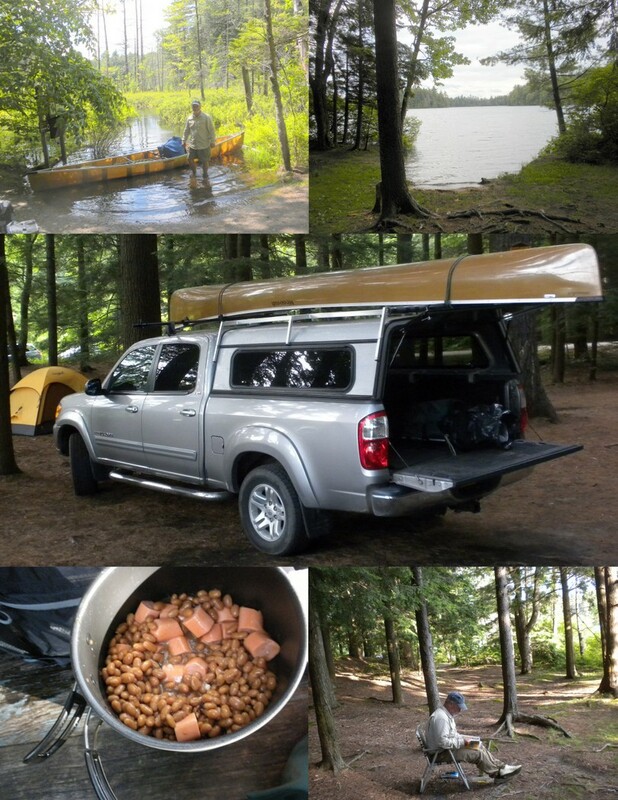 We decided to use the access to the St Regis Canoe area and portaged to Mud and Bear Ponds looking for a suitable campsite. As shown by the picture below the water levels were unusually high due to the frequent rains this summer. Our search for a dry and bug free campsite was not successful so we decided to return to the truck and camp in one of the Floodwood campsites for the night. We stayed at site #3, set up our tents, relaxed and read, and had a dinner of hot dogs, beans, bagel, fruit cup and Oreos. The next day we found the boat launch at Paul Smith’s College. The 350-acre Lower St. Regis Lake has as its northern edge Paul Smith’s College, There’s five miles of shoreline to explore around this lake. The narrows that access the lake offer scenic paddling in the region and are a destination themselves. There are several dirt floor lean-tos scattered along the shoreline. There is a trail to St. Regis Mountain provides a view with only a moderate climb, however we did not choose to hike. We paddled from Paul Smith’s to the outlet dam and examined several available lean-tos along the way; most had dirt floors. On our return we visited Peter’s Rock which had a huge sloping rock to the water and a fine lean-to. Upon our return we will paddle Spitfire Lake.